Hypertension or high blood pressure, is a common condition in which the force of the blood against the artery walls gets to be so high that it may cause health problems, like heart disease or stroke. Hypertension becomes more common with age, affecting middle-aged women especially. 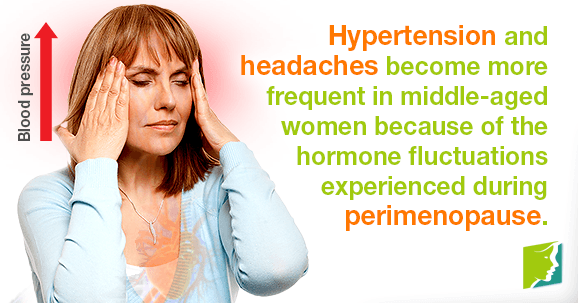 Headaches also affect middle-aged women frequently because of the hormone fluctuations experienced during perimenopause. Headaches can range from mild, everyday tension headaches to debilitating migraines that can last several hours. Essentially, the more blood the heart pumps and the narrower the arteries, the higher the blood pressure. Hypertension becomes more common with age because it develops over the years. Hypertension can do damage to the heart and arteries if left untreated. It can be easily detected, so it is important to have regular checkups and work with a doctor to control it. Most people with hypertension do not show signs or symptoms. Occasionally, people with early-stage hypertension get dull headaches or dizzy spells. In many cases, there is no discernible cause of hypertension, but rather, it develops over the years. Sometimes, hypertension can be caused by another health condition, like kidney or thyroid problems. Hypertension is more common in men during middle age, around age 45. Women are at a higher risk of developing hypertension after age 65. Headaches are common among middle-aged women, and can be linked to things like poor diet and hormone fluctuations. Women are five times more likely to experience headaches than men, and they are more vulnerable to frequency and intensity of headaches as they approach menopause. Tension headaches are the most common type of headaches, and are defined as the constant, dull headaches that typically do not last more than a few hours. Migraine headaches are much more severe, and are characterized by a recurrent, throbbing pain that starts on one side of the head. Migraines can last anywhere from a few hours to a few days. Although hormone imbalance is the main cause of menopausal headaches, there are other outside triggers that can cause them. It is essential to get regular checkups with a doctor to keep hypertension and headaches at bay, especially as a middle-aged woman. Maintaining a healthy and active lifestyle is the best thing to do for overall health and preventing hypertension and headaches during middle-age. Exercising regularly is vital for maintaining efficiency of the body's systems and improving heart health. Yoga, walking, and swimming are all low-impact workouts that can be very beneficial. The general recommendation is around 30 minutes of aerobic activity every day. Eating healthy and avoiding fatty, salty foods is also crucial for preventing hypertension and headaches. Read all about headaches during perimenopause and what you can do to manage and prevent them from making day-to-day life difficult. Discover how menopausal hormonal imbalances cause headaches and raise blood pressure, and learn how to regulate these symptoms. Discover the facts about high blood pressure and how it causes headaches, and discover ways of managing both symptoms.